A countertop plays a huge role in your bathroom. And no, it is not just about keeping soaps, shampoos and a bunch of other toiletries on it. The prefect countertop fits in with your bathroom, and adds the right touch of sophistication and elegance (or simplicity if that’s what you want). The countertop occupies a significant portion of real estate in your bathroom and hence, it is a large visual factor in your bathroom. When it comes to picking a countertop, you have plenty of options. The challenge is to pick the right one. If you are currently undergoing a house or bathroom remodeling, you need to allocate sufficient funds from that budget to purchase a countertop. Here are a few things to think about. – How is your financial situation? – How much are you willing to spend? Setting a budget matters because you can automatically narrow down on a particular price range of countertops. This way you don’t waste time on the cheaper ones or the more expensive ones. How much maintenance effort are you willing to put in? Buying an expensive countertop is all right, but it also must be taken care of. Most countertops are easy to clean. However, there is a question of how regularly you want to be cleaning them. A tile grout lined countertop needs regular cleaning, while granite countertop may be required to be sealed. Color plays two major roles when it comes to selecting the right bathroom countertop. 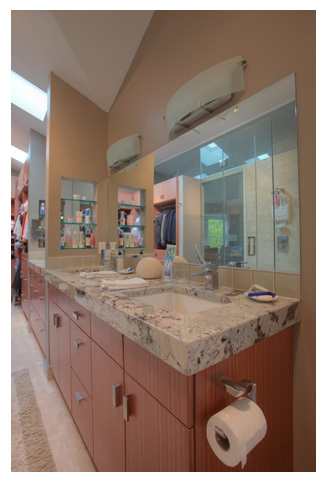 – A countertop will only fit into the visual impression of your bathroom if it is the right color. The safest color to pick is black. If not, go for a dark color. – How often will you be cleaning? Darker the color, the less noticeable will dirt and stains be on your countertop. What are you looking for when it comes to style and layout? You have to base your style and layout decision on functionality and visual impression. For example, do you want it to have sharp or exposed edges? Like any shopping, you should take your time. Rather than waste time hunting through various shops, head over to K&J’s Custom Granite, where we have more than sufficient options for you. Plus, the experts at the shop have plenty of experience in giving the best advice. Also, it doesn’t hurt to carry a picture of the bathroom on the phone. It will help with a visualization of the countertop actually being in the bathroom. And, the store experts will be able to understand which countertop will fit in your bathroom. If you are not renovating your home, then you don’t have professionals at home. Hire a professional to install it so that it’s properly done. At the end of the day, ensure you pick out something that you like, that suits your bathroom, and fits within your budget.